Summer Shadows and a Must-Have Brush Set. Oops! Always take your product shots before you start clarting about with something… Oh well. I like to see something well-used. 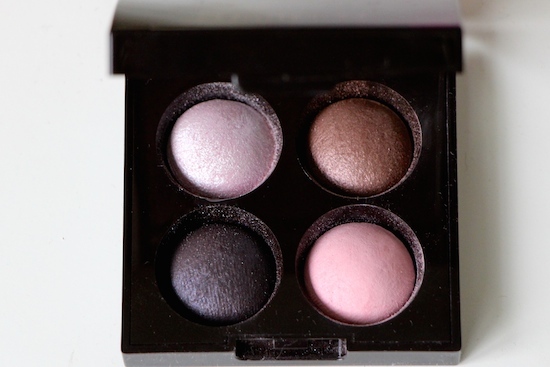 And I have been using this baked eyeshadow quad from Laura Mercier almost every day for the last couple of weeks; its pinky-warm tones just seem very right for this time of the year. The pearly pink shade (top left) is really very vibrant and eye-catching; a quick wash of this over the lids and you suddenly look very done-up. I like to blend it with the pinky-pink (bottom right) and then use the two darker shades towards the outer corners of my eye. Just my typical eye routine, I suppose, but the quad – quite poetically named Rendez Vous in Monte Carlo – fits into that routine very nicely. 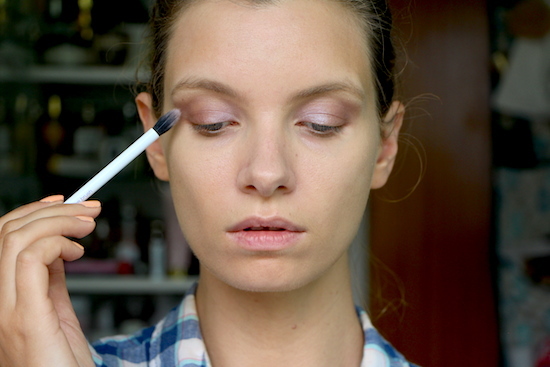 The eye brush I’m using is from the Real Techniques Duo Fibre set – I really like it. I wasn’t sure, at first, what the point of it was but it tickles the shadow on with such a wonderfully light touch… I used it to apply all of the shadows and blend them in, just very delicately and gradually. Some might find it too whimsical but I enjoy using it and I think that if you’re prone to being heavy-handed, it’s a good tool to keep you in check. As is the large face brush in the same set – one of the best ever brushes for applying bronzer, face powder and the like.. You can find the set here – it costs £23.99 with free delivery. I still don’t use the medium brush very much, but to be quite honest, I’d pay twenty three quid just for the large one. It’s priceless, I would be at a loss without it! Next Post What I Wore with my Slicked-Back Hair.